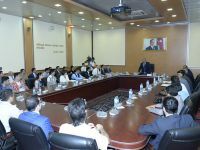 A meeting was held at the Ministry of Communications and High Technologies (MCHT) with the winners and participants of the competitions State Fund for Development of Information Technologies and “Startup Azerbaijan”. The main purpose of the meeting was to exchange views on expanding of startup movement in the country and current problems in this area. The event was also attended by startup companies operating in the field of information technologies. Minister of Communications and High Technologies Ali Abbasov spoke about rendering of financial assistance in the form of grants to new startups and small businesses established for the purpose of development of entrepreneurship in the field of information and communication technologies (ICT). Elchin Zeynalov, Executive Director of the State Fund for Development of Information Technologies informed about the purpose of the meeting and the support provided to startup projects by the Fund. The event saw presentations of the projects that won first and second grant competitions of the Fund, as well as a film was shown on the activities of the Fund. At the end of the meeting, they discussed concrete proposals for the development of entrepreneurship in the field of ICT and exchanged views on the proposals. Note that the Fund holds grant competitions in the development of innovative ICT services and products. Thus, persons wishing to participate in the next grant competition can submit their projects by passing online registration in the e-grant section on the Fund’s official website (www.ictfund.gov.az).